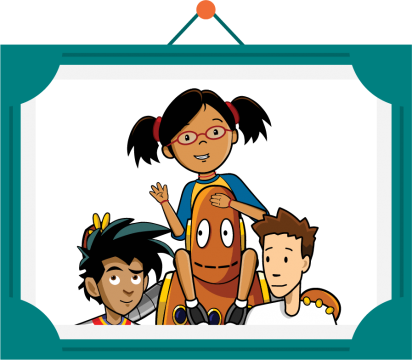 If your child's school has a paid subscription to BrainPOP, your family automatically has access at home, too. Sign up to receive timely tips and ideas for how to use BrainPOP's movies, tools, quizzes, and other resources to extend learning at home and reinforce what your child is learning in school. Encourage creativity, connections, construction, and collaboration. Explore BrainPOP's movies, learning games, quizzes, and other resources. That means you've got access at home, too. Your School Subscribes to BrainPOP! Unlimited access to trusted and award-winning digital content, including animated movies, learning games, coding or movie-making activities, and more. Ask your child for the username and password. A teacher can provide it as well. Log in with your child any time to dig deeper into schoolwork or explore other interests together. Unlock all that BrainPOP has to offer by signing up now to receive tips and ideas for making the most of this award-winning resource from the comfort of your home... or on the go! Questions about using BrainPOP at home? © BrainPOP. All rights reserved. For information on BrainPOP trademarks & copyrights, visit brainpop.com/trademarks.